Well, that’s depressing. 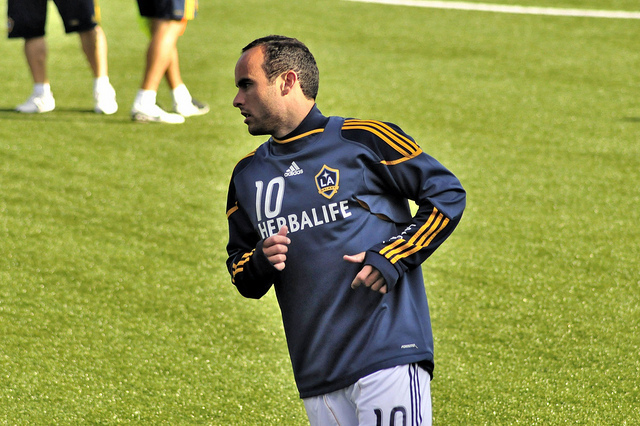 Those were our immediate thoughts surrounding Landon Donovan’s exclusion from the twenty-three-man roster that’ll be representing the USA at the 2014 World Cup. We’re officially beyond the Donovan era in professional soccer, and while that might not mean as much to you as, say, Michael Jordan’s retirement (specifically his second retirement, when he left Chicago in 1999), it’s similar, given Donovan’s status as the best American soccer player ever — that’s not an ironic statement, by the way. The dismissal wasn’t out of the blue — Jürgen Klinsmann, the man behind the roster decisions, had what might be charitably described as a rocky relationship with the standout forward, who has definitely lost a step, struggling to find a place for him in the friendly matches leading up to the roster decision — and the highest scoring player in this history of the USMNT was always going to play a diminished role on the current roster, but it doesn’t seem right. Donovan has worn an international jersey more than any other U.S. player, and with the sport finally, possibly, maybe getting the respect it deserves stateside — there aren’t any numbers behind that, just a notion based on increased coverage and accessibility in a fully developed Internet age — Brazil 2014 would’ve been the perfect time to pull out all the stops and do a massive public sendoff for the soccer superstar we never really acknowledged we had. Even if interest in soccer is on the up swing, the only time any non-fan in the U.S. gives it the time of day is during the World Cup. With the U.S. facing such an uphill battle anyway, why not add a little silver lining, even if he’s coasting on the laurels of his past performance? The thrust of the argument around leaving Donovan at home resides in a house of results, and the logic that if Donovan’s maximum effort and ability is only equivalent to, say, 70 percent of another players, then he doesn’t deserve a spot on the team. There’s also the notion, popular in other American sports, that if we’re not going to win it all, we should focus our efforts on rebuilding — playing the less tested players, the ones who will be on the squad when they hit Qatar in 2020. That’s all true, but it’s totally missing the point. And, also, Donovan deserved to make the team so that Johnathan Klinsmann’s son wouldn’t have responded to the news with a (now deleted) tweet saying “HHAHAHAHAHAHAH DONOVAN HAHAHAHAA I DIDNT EVEN NOTICE UNTIL MY PHONE NOTIFIED ME HAHA .” (capitalization and lack of apostrophes his) Can’t Landon take the younger Klinsmann’s spot? World Cup: The 7 Best Soccer Players to Ever Suit Up for the U.S.